Helen describes her pots as 'serious, posh and frivolous' because for many years she was a functional potter, making batches of domestic pots on the wheel. These more recent pots are hand built individually and each is considered separately. 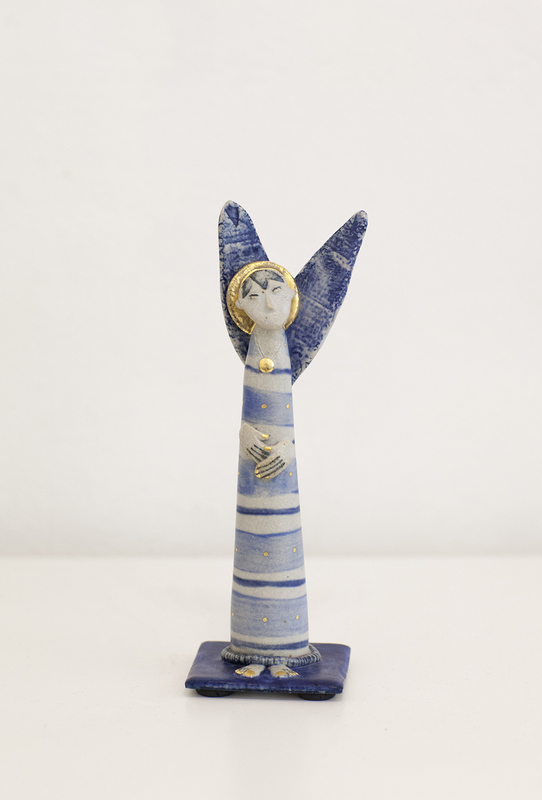 Helen makes ceramic sculptures which embody a sense of narrative. Each piece within a series explores an element of the story through a change in scale, movement, composition or colour. Helen is fascinated by body language within both the moving and still image. She finds inspiration, for example, in the exaggerated and stylised movements expressed by actors in silent movies - but she finds equally interesting, the way in which narrative is depicted within Mogul and Persian miniature paintings. Here, a still gesture, combined with often intricate and symbolic composition, captures a moment which tells both a past and a future story. Helen's sculptures, often intimate in size, relate to this single moment where great, or small, events in people's lives are revealed by gesture and communication. Helen works in Cambridge and is a founder member of Cambridge Open Studios. She finds that her past, present and future, her friends and the things that happen day to day have become sources of inspiration in themselves. You and Me. Me and You.